Widespread thunderstorm activity is again expected over coming days, with Western NSW and NE NSW / SE QLD looking the best for today. Some areas have quite a nice shear profile. Took this looking out of Goonellabah towards the Casino area. There lots of rumbling happening and a definite anvil shape in the cloud. Some lightning around too. Will post a few shots shortly. A couple pics from this afternoon's action. 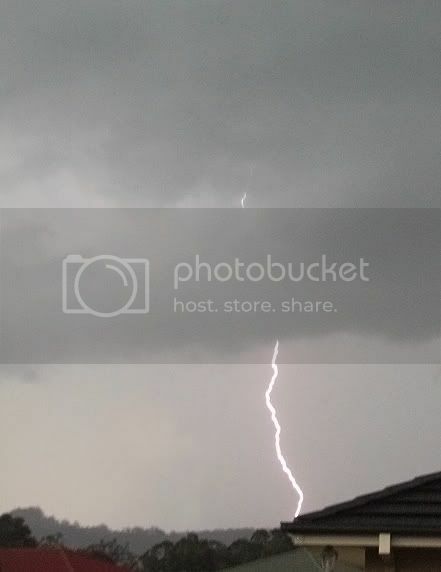 There were some amazingly close bolts around, most of which came down while trying to position myself away from oncoming car headlights during the larger, later storms? This was the first time my dad (70yrs) had come out with me and even he was getting frustrated by all the great bolts I was missing lol, all I could do was laugh and tell him that was a pretty normal part of lightning photography. The first shot is from the LP cell that was first off the ranks this afternoon. The rest are from the 2 cells following. 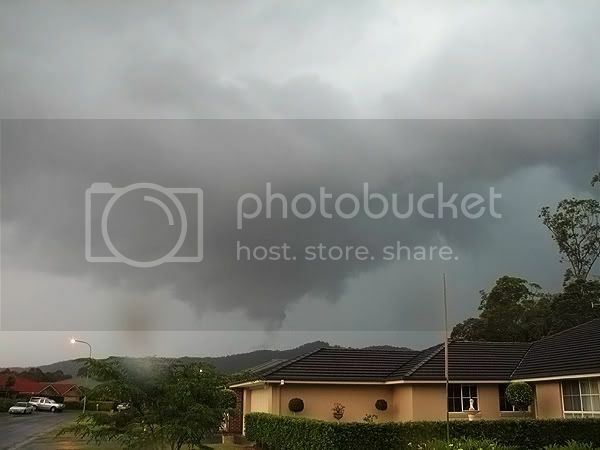 Another storm in Coffs Harbour today. Had stacks of lightning and many were close when it moved over. They also wanted to pulse a lot. 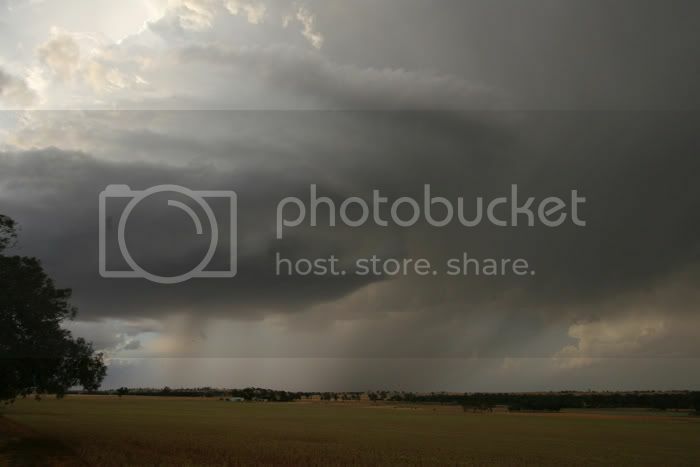 Heres some pics of the storm, no severe weather in my area probably some further north near Nana Glen or so. Hi all, went out on a chase yesterday with Michael Bath and Jason( WZ Pato).Headed out to near Casino and watched a few weak cells trying to get going.We then decided to change position and move to the north of town to see some cells finally fireing.These cells were very Cg active and strobed pulsed many times. 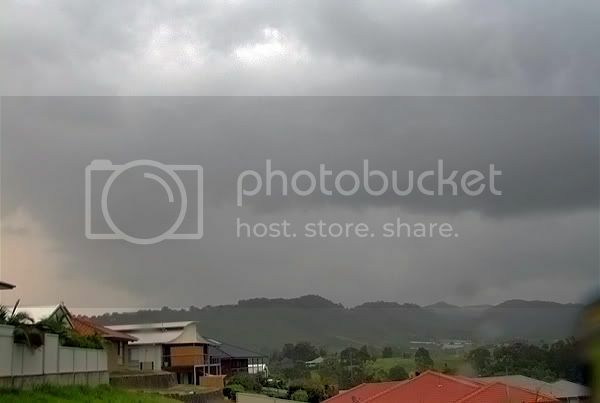 Moving to Kyogle we then set up at a vantage point and enjoyed a wet Cg barrage onto the township in light rain with wind photographing was difficult. The cells exhibited very low bases at times and with the very moist profile of the cells very heavy rain was observed. Had an enjoyable afternoon Go NRTH NSW!!! A few of mine from yesterday arvo to add to the collection of great storm structure and lightning photos in this thread. The first 5 are from just NW of Casino. This storm was nicely organised for at least 30 minutes and during that time put out an extraordinary number of pulsing CGs. The timelapse video of this storm should be very interesting. We then moved to the Kyogle lookout. As Rodney mentioned, photographic conditions were quite difficult, but this storm sure put out some lovely close lightning ! It was a bit freaky with the bolts that close but it's hard to leave a scene like that. 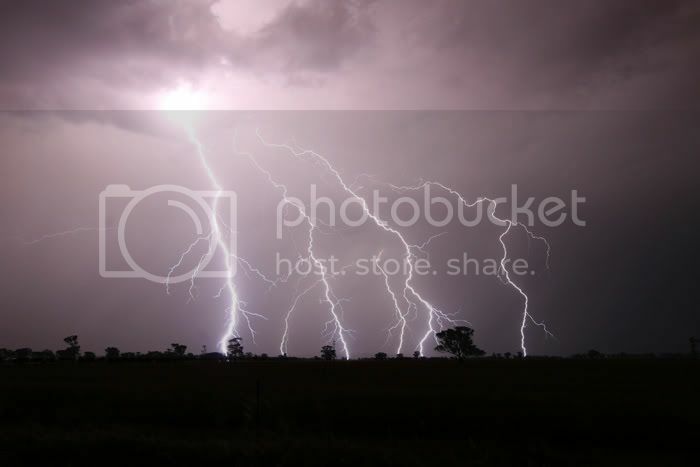 We had some very active thunderstorms roll over Narrabri from 2am-5am. The lightning detector peaked at about 40 strikes/minute within 56km range. Local weather stations recorded a very quick 10-21mm from it. Convection has started kicking off again this morning but it is all heading east at a great rate of knots. Skies have mostly cleared here, but looks like it will be a very busy day on the tablelands. Gold coast certainly copped a nice light show last night! I would have managed pics had i remembered to take the camera with me!The lightning carried on till way after 10pm here in carrara then had a nice little cell come accross at 4am this morning that was fairly lightning active and it carried some decent rain in it as well. 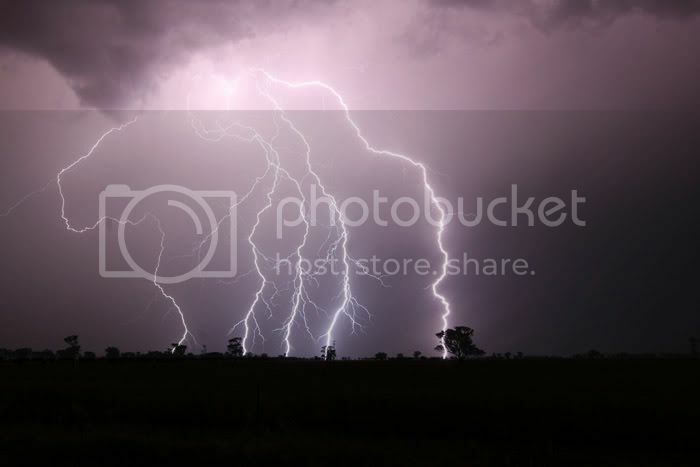 The lightning went till at least 6am, so got a beautiful wake up call this morning the thunder was that deep and low that the windows vibrated in the top floor of my place as well as waking up my daughter who can sleep through just about anything! Well as Rodney mentioned earlier, I headed out on my first real chase with himself and Michael. As Rod and Michael have already explained we encountered two very CG active storms near Casino and Kyogle. I managed to capture my first lightning shots( due to the strobing nature of the bolts). As I have only a point and shoot camera I was pretty happy however as you can see next time I'll have to remember to take my tripod. And I think it might be time to upgrade my equipment to DSLR. Anyhow hope you enjoy. the southeast corner is starting to fire up with sever warnings out for southeast qld and queensland inc granite belt and darling downs, looks like tonight will be another good light show! Very nice photos guys and I hope you had a lot of fun out there. I was at home when the storms moved over Uki just on dark last night. I did take a number of pics but mostly they came out as just lighting up the sky. There were some CG's and a few loud cracks nearby but my camera missed those. Doh!! Anyway the lightning was pretty neat and rainfall was light to moderate. Hi all, went for a chase this arvo....5 steps out to the back verandah.Michael Bath was here to enjoy the show. Boy did it rumble and crash and put on some pulsey Cg's just accross the valley!!! 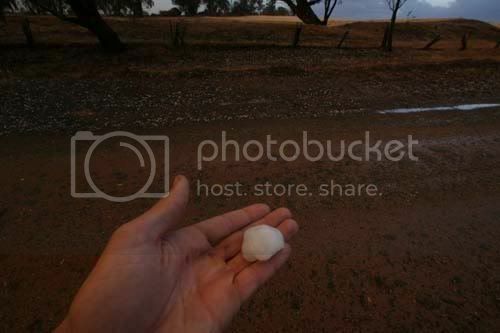 Heavy rain soon followed mixed with hail up to 2cm in size which melted quickly. Had an enjoyable afternoon Go NRTH NSW!!!! Some brilliant photos in this thread. Well done! Me and a mate of mine chased the Southwest Slopes yesterday evening and overnight. Convection,didnt get going until late,and this made us worried for a while there. 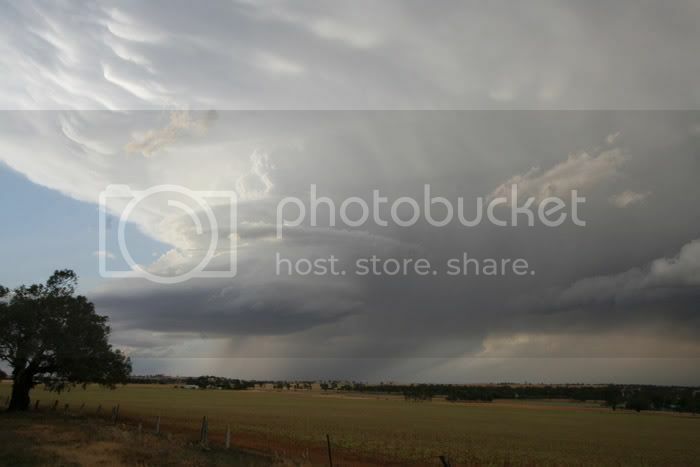 The first storms developed south of the border near the town of Yarrawonga. One of these storms became severe displaying a nice backsheared anvil,but this storm was far to south to even bother with. 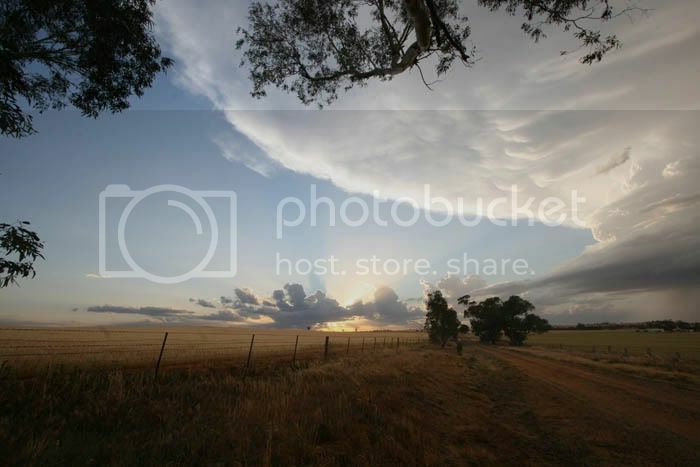 We encountered our first storms of the evening near Temora.One of these storms had some fantastic lp structure,and it was rotating nicely as well! This storm delivered nothing but hail,ranging from 2cms up to nearly golf ball sized. More storms continued throughout the night producing some awesome lightning at times. A great chase. Its nice to get my first decent storms of the season as well.